More details on our activities can be found here? ULB astronomers contribute to ESA's Gaia astrometric mission, which released data for 1.4 billion stars today. Astrophysicist working at ULB, formerly research associate of the Fund for Scientific Research (FRS-FNRS), Sophie Van Eck contributed to the imaging of pi Gruis, a giant star located 530 pc away in the southern constellation Gruis, using European Southern Observatory Very Large Telescope Interferometer. Astronomers using ESO’s Very Large Telescope have for the first time directly observed granulation patterns on the surface of a star outside the Solar System — the ageing red giant π1 Gruis. This remarkable new image from the PIONIER instrument reveals the convective cells that make up the surface of this huge star, which has 350 times the diameter of the Sun. Each cell covers more than a quarter of the star’s diameter and measures about 120 million kilometres across. These new results are being published this week in the journal Nature. Located 530 light-years from Earth in the constellation of Grus (The Crane), π1 Gruis is a cool red giant. It has about the same mass as our Sun, but is 350 times larger and several thousand times as bright. Our Sun will swell to become a similar red giant star in about five billion years. An international team of astronomers led by Claudia Paladini (ESO) used the PIONIER instrument on ESO’s Very Large Telescope to observe π1 Gruis in greater detail than ever before. They found that the surface of this red giant has just a few convective cells, or granules, that are each about 120 million kilometres across — about a quarter of the star’s diameter. Just one of these granules would extend from the Sun to beyond Venus. The surfaces — known as photospheres — of many giant stars are obscured by dust, which hinders observations. However, in the case of π1 Gruis, although dust is present far from the star, it does not have a significant effect on the new infrared observations. While stars more massive than eight solar masses end their lives in dramatic supernovae explosions, less massive stars like this one gradually expel their outer layers, resulting in beautiful planetary nebulae. Previous studies of π1 Gruis found a shell of material 0.9 light-years away from the central star, thought to have been ejected around 20 000 years ago. This relatively short period in a star's life lasts just a few tens of thousands of years – compared to the overall lifetime of several billion – and these observations reveal a new method for probing this fleeting red giant phase. [20/10/2017] Cosmic Crashes Forging Gold: ULB and Max Planck Institute astrophysicists did predict it back in 2011! The observation, made public on October 16 2017, that neutron-star mergers emit gravitational waves and visible light with signatures of heavy elements validates a prediction made by scientists of the Max Planck Institute for Astrophysics (MPA) and of the Free University of Brussels (ULB) back in 2011. 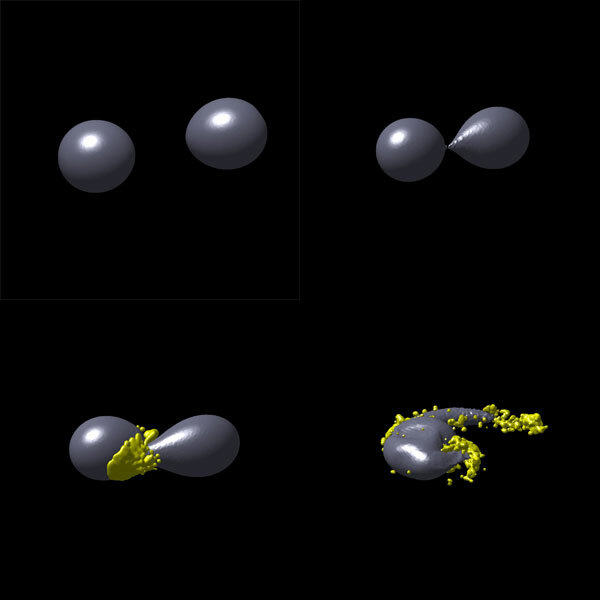 They had identified that ejected matter from neutron stars merging in a violent collision provides ideal conditions to produce the heaviest chemical elements such as lead or gold. 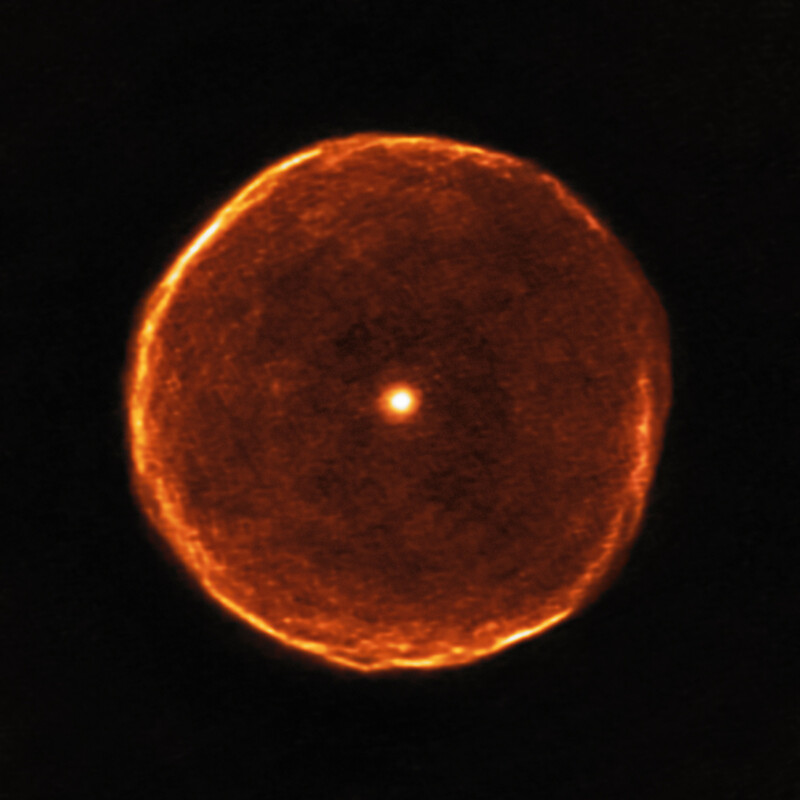 Astronomers have used the ALMA radio telescope array to capture a strikingly beautiful view of a delicate bubble of expelled material around the exotic red star U Antliae. These observations will help astronomers to better understand how stars evolve during the later stages of their life-cycles. In the faint southern constellation of Antlia (The Air Pump) the careful observer with binoculars will spot a very red star, which varies slightly in brightness from week to week. 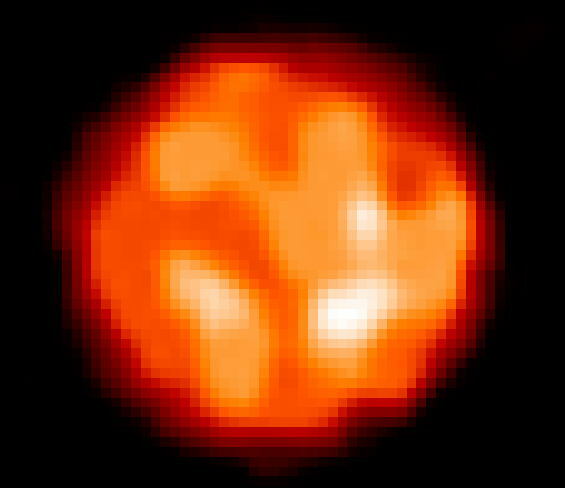 This very unusual star is called U Antliae and new observations with the Atacama Large Millimeter/submillimeter Array (ALMA) are revealing a remarkably thin spherical shell around it. This research was presented in a paper entitled “Rings and filaments. The remarkable detached CO shell of U Antliae”, by F. Kerschbaum et al., to appear in the journal Astronomy & Astrophysics. The team includes C. Paladini (Université Libre de Bruxelles, Belgium).